Each November, students, faculty, and staff at UBC Okanagan take a moment to remember our fallen at a special Remembrance Day service. Members from Kelowna’s Royal Canadian Legion, Branch 26, will be on hand, including a colour party, to mark the solemn event on Friday, November 7. UBC Okanagan administrators along with Royal Canadian Legion guests will speak briefly about the importance of Remembrance Day in Canada, especially in light of the recent tragic events in Ottawa and Montreal. The traditional two minutes of silence, along with a bugle reveille and bagpipe lament will be part of the formal service. 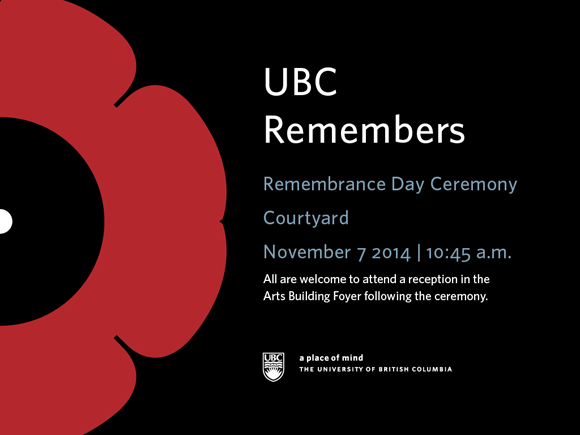 UBC students will have an active role in the event, reciting poems and two students, Trooper Cody Lauterbacher and Trooper Thomas Fisher who are members of the British Columbia Dragoons, will assist with the laying of the wreaths. After the formal service, a reception in the Arts Building foyer will take place. The public is invited to attend this service that begins at 10:45 a.m. on Friday, November 7. Pay parking is available on campus. 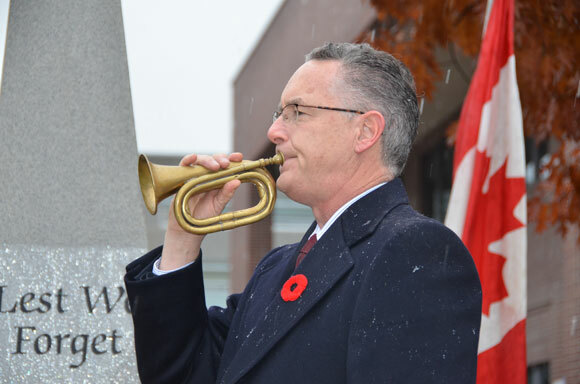 Dennis Colpitts is the ceremonial bugler for UBC’s Remembrance Ceremony on Friday.